Through extensive research with families across the United States, Search Institute has identified five keys to that help young people be and become their best selves. Many people can have these kinds of “developmental relationships” with children and youth. But mothers, fathers, and other parenting adults have central and powerful relationships that typically begin before childbirth and continue throughout life. The challenge and opportunity is to work together to keep those relationships strong, flexible, and resilient as each person grows and changes. We created Keep Connected to help you do just that. Expand possibilities—Connect me to people and places that broaden my world. Learn more about specific actions you can do in relationships to help kids thrive. Take a quiz about these five keys in your family. Invite other family members to do it too. Then compare results. What Strengths Do Families Experience in their Relationships? 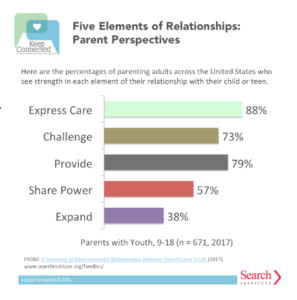 In 2017, Search Institute asked 671 parenting adults across the United States to reflect on their relationship with their child. Most parents say they Express Care, Challenge Growth, and Provide Support for their kids. They are less likely to say they Share Power and Expand Possibilities. What about your family? Take a quick quiz to check your own relationships. Have other family members do it too, then compare your perspectives. 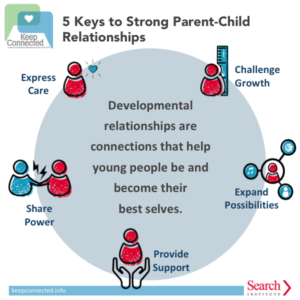 Why Do Developmental Relationships Matter? Read more research on the power of family relationships. Take a quiz to see how you see relationships between yourself and your child or children. Then invite other family members to try it, too. Compare results, then decide where you want to focus. Ben-Eliyahu, A., Rhodes, J. E., & Scales, P. C. (2014). The interest-driven pursuits of 15 year olds: “Sparks” and their association with caring relationships and developmental outcomes. Applied Developmental Science, 18(2), 76–89. doi:10.1080/10888691.2014.894414. Borawki, E. A., Ievers-Landis, C. E., Lovegreen, L. D., & Trapi, E. S. (2003). Parental monitoring, negotiated unsupervised time, and parental trust: The role of perceived parenting practices in adolescent health risk behaviors. Journal of Adolescent Health, 33(2), 60–70.